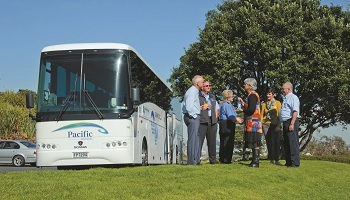 Grand Pacific Tours is New Zealand's premier escorted coach touring specialist offering a range of all inclusive, high value for money vacations. Choose from five style of touring with a selection of itineraries to suit all budgets and interests. Over 200 guaranteed departures a year ensure your trip is secure. Grand Pacific Tours offers something for everyone with their five distinctly different styles of touring. If you’re looking to travel with a small group of travelers staying in premium accommodation with no more than 20 travelers per tour, then the Ultimate Small Group Tour is for you! Perhaps you’re looking for a slower pace of travel with longer stays in each destination, but still traveling in superior accommodation – the Luxury Escorted Coach Tour is what you’re looking for. For an unbeatable value, the Affordable Coach Tour offers quality hotel accommodation with the majority of meals included including four tour options ranging from 8-16 days. Looking to explore New Zealand by land and sea or interested in focusing on a specific interest? Grand Pacific Tours also offers Cruise & Luxury Coach Tours as well as Special Interest Tours. Whatever your heart desires in New Zealand, Grand Pacific Tours will help you discover it. The beauty of travelling aboard the Ultimate Coach in a small group is that every aspect of your holiday is personal. Be treated as a VIP and enjoy premium accommodation combined with a number of exclusive extras. 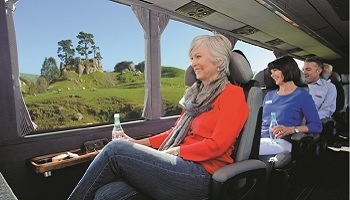 Relax and enjoy the stunning regions and intriguing history of New Zealand on your choice of four itineraries featuring unique experiences. A Tour Guide will accompany the group to ensure everyone feels welcome and relaxed from day one. Enjoy modern luxury on a cruise across the Tasman Sea on board the indulgent Celebrity Solstice. Combine this with a scenic coach tour and see the best of New Zealand's iconic attractions and stunning landscapes not included on the cruise, giving you the complete New Zealand experience. Let your Interests take you on a journey of New Zealand. Whether you are looking for a festive getaway, travelling solo, love lawn bowls, the grandeur of gardens or the thrill of aviation, we've got it covered.